Non porosity and hardness provide the best durability in whiteboard surfaces. Porcelain not only resists scratches and dents, markers don't penetrate the surface. These properties mean easier, more effective cleaning and longer life. Recommended marker pens can be dry erased. Each board has a clear anodised frame with plastic clip on pentray and rounded plastic corners that conceal the wall fixing screws. Sizes are "nominal" and in some cases the overall size is 12mm larger than shown below. Price GST inclusive and includes delivery of a fully assembled product to Perth Metro Government Buyers. 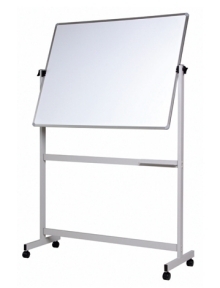 Custom size whiteboards are manufactured to your sizes. Please enquire for pricing. Use only quality dry erase markers. Avoid household cleaners especially abrasive cleaners. Clean up text and drawings as soon as not needed. Replace erasers on a regular basis. Clean your whiteboard before first use and on a weekly basis using liquid whiteboard cleaner. Use liquid cleaner sparingly over the surface. Clean with soft paper towel or lint free cloth. Buff to a shine. If you need to use methylated sprits or acetone to remove permanent marker, avoid pre-printed markings as these will be damaged.